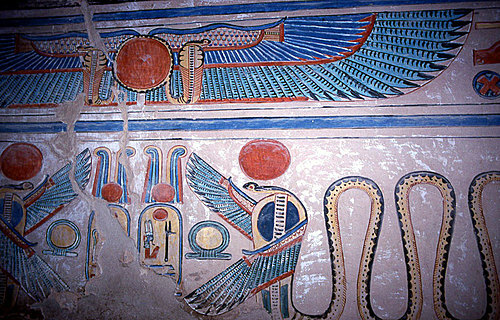 In this charming tomb Ramses III himself leads his son Amon-hir-khopshef into the presence of the divine gods of the underworld. The nine-year-old boy wears the side-lock of youth and carries the feather of truth as he obediently follows his father. The reliefs are of fine quality painted low relief, in excellently preserved colour. In fact the murals of this tomb are amongst the finest on the necropolis. The tomb comprises a large entrance hall with an unfinished annex to the right and the tomb chamber (unfinished). On the left-hand wall, travelling clockwise, we see the young prince following the Pharaoh Ramses III, who offers incense to Ptah (a) and then introduces his son. Afterwards he presents the boy to Duamutef and to Imseti (b), who conducts the pair to Isis. Note that Isis (c) looks over her shoulder to the advancing Pharaoh. She holds him by the hand. On the right-hand wall (continuing clockwise) Ramses and his son are conducted to Hathor (d), Hapi, Kebhsnewef (e) Shu (d) and Nephthys (g) who puts her hand beneath the chin of the bereaved Pharaoh. The corridors bear scenes from the Book of the Dead. There was no mummy of the boy in the sarcophagus but in its place was a foetus of six months’ development. Perhaps the mother miscarried due to grief at the loss of the boy. One can only speculate. The foetus is preserved in a small hermetically sealed glass in the tomb.